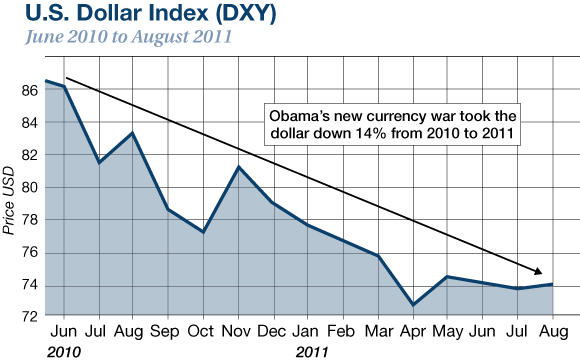 The response to U.S. efforts to cheapen the dollar in 2010 - 2011 was not long in coming. It came from four directions - IMF, Russia, China, and Saudi Arabia. Enter the new world money: Petro-SDR. Less than a year after Obama's declaration of a new currency war, the IMF released a paper that is a blueprint for implementation of a new global reserve currency called the Special Drawing Right (SDR), or world money. China's and Russia's immediate response to the coming dollar collapse and rise of the SDR is to buy gold. (It's not yet possible to diversify heavily into SDR denominated assets because there are very few SDR assets available.) Russia has acquired over 1,000 tons of gold in the past seven years, and China has acquired over 3,000 tons of gold in the same time. Saudi Arabia's response has been more subtle, but may be more dramatic in the end. Relations between Saudi Arabia and the U.S. have deteriorated sharply over the course of the Obama administration. The primary cause was the Iran-U.S. nuclear negotiations and what amounts to the U.S. recognizing Iran as the leading regional power. Note: The chart covers major currencies only, while the Fed's broad index covers all trading partners. The Saudis have threatened to dump their U.S. Treasury securities in response to the release of the secret report, but so far that threat has not materialized. Saudi Arabia is dealing from a position of weakness in relation to the U.S. Saudi Arabia is now running a fiscal deficit rather than a surplus, so the issue of where to invest reserves is moot. In fact, Saudi has been selling its reserves, mainly U.S. Treasuries, to cover its fiscal deficit. The U.S. is no longer dependent on Saudi Arabia for energy supplies. It has become a net exporter of energy and has the largest oil reserves in the world. 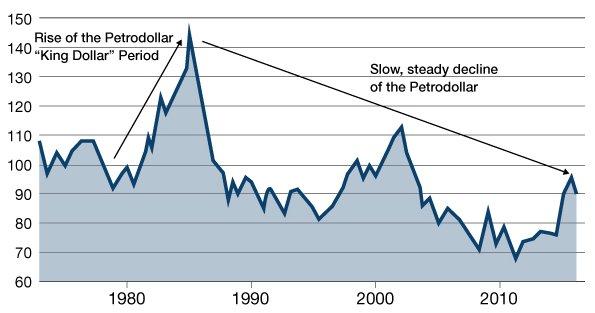 All of the conditions that gave rise to the petrodollar now stand in the exact opposite position of where they were in 1975. Neither the U.S. nor Saudi Arabia have much leverage over the other, in contrast to 1975 when each side held powerful trump cards. This does not mean that oil will be priced in a currency other than dollars tomorrow. It does mean that a new pricing mechanism is possible and no one should be surprised if it happens. Saudi Arabia could easily price oil in yuan, then swap the yuan for Swiss francs or SDRs, and use the proceeds to add to its reserves or buy gold. Saudi Arabia could also price oil in SDRs or gold and hold those assets or swap them for other hard currencies to diversify away from dollars. All of these trends - IMF support for SDRs, Russian and Chinese support for gold, and Saudi Arabia's search for a new benchmark for oil - came to a head in Hangzhou, China at the G20 Leaders' Summit, almost seven years to the day after the Pittsburgh G20 Summit that spawned the new currency war. China's President Xi is the President of the G20 for 2016, has made strides on the world stage as an equal partner with the U.S. in the management of the international monetary system. Now, less than four weeks following the G20 Summit, the yuan will officially join the SDR. The yuan will make up over 10% of the SDR. From there, new issuance of world money (SDRs) will be supported by China because every time the IMF issues new SDRs, they will be expanding the role of the Chinese yuan as a reserve currency. Gold, yuan, and SDRs all have one thing in common - they are alternatives to the dollar. As momentum toward these alternatives grows, the role of dollars as a reserve currency could diminish quite quickly - like sterling's role between 1914 and 1944. The result for dollar holders will be exactly the same as the result for sterling holders: inflation and lost wealth. New political and financial arrangements, and new forms of energy, will no doubt emerge over time. The key to wealth preservation is to move out of the declining form of money - dollars - and into the rising forms of money - gold and SDRs - sooner rather than later.